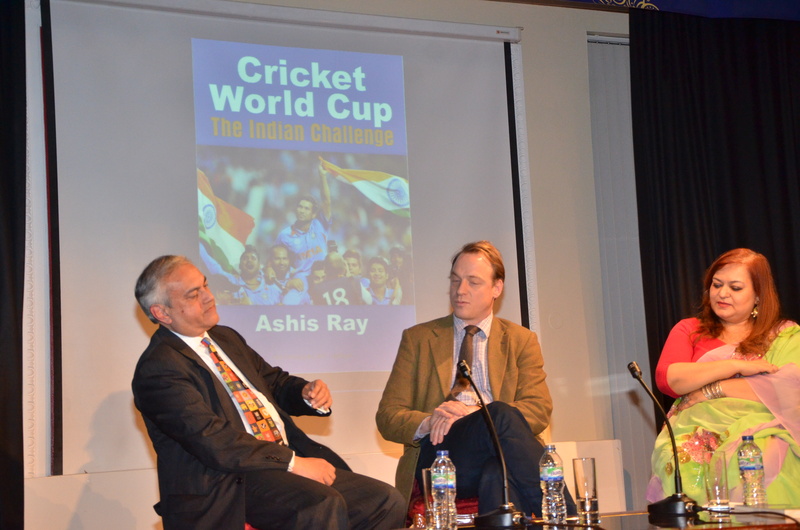 Veteran Sports journalist Ashis Ray along with Bloomsbury Publishing launched his book 'Cricket World Cup: The Indian Challenge', on February 25th at London's Nehru Centre in presence of HE Ranjan Mathai, the Indian High Commissioner, Lord Swarj Paul, Gopichand Hinduja, CB Patel and many other dignitaries. This was followed by a Q&A with James Astill, Political Editor of the Economist, where Ray discussed his book, the changing scene of Indian cricket, the historic 1983 victory, Indian cricket team Captains over the years and the current World Cup. In India, Ray's work was specially applauded by the Indian President Pranab Mukherjee. On Saturday 14 February, the President of India Pranab Mukherjee formally received a copy of the recently released book at a brief ceremony at Rashtrapati Bhavan (President's House). The presentation was made by Madan Lal, one of the heroes of the Indian side that won the 1983 Cricket World Cup, in the presence of the author. The President commended the author for providing a history of the World Cup from an Indian perspective. He also thanked Madan Lal for triggering a "turning point" for India in cricket by famously dismissing Vivian Richards, the West Indian master batsman, in the World Cup final at Lord's in 1983. Mr Mukherjee recalled Indira Gandhi, then India's Prime Minister, phoned him late a night Indian time after India's 1983 victory to share the good news. He was then the Union Finance Minister. Author Ashis Ray said, "It is a great honour to be granted an audience by the President of India. Therefore, I consider myself fortunate that he did so and formally received a copy of my book. I hope the kind gesture on the part of the President encourages people to read the book and encounter or relive for themselves India's history in the Cricket World Cup." The Acting High Commissioner of India to Australia, Manika Jain also launched Ashis Ray’s book in Melbourne on Saturday 20 February, congratulated him on writing the book and Bloomsbury for publishing the work. “I have great pleasure in launching this book in Australia,” said Jain. Speaking to Asian Voice exclusively, when asked who is Ray's favourite amongst Ganguly and Dhoni as a Captain, Ashis said with a smile, "Ganguly's record as captain in test cricket outside India proves he was a better tactician than Dhoni." Explaining, he referred to Chapter 6 of his book, and added,"While his critics said he was asking for it, the BCCI's treatment of Ganguly is indefensible. Any cricketer deserves courtesy if he is to be omitted from the national side, especially if he's been the country's most successful skipper ever (which he was at that point)." "Ganguly was un-parochial. Practically none of the players successfully drafted in or recalled during his tenure (as captain) was from his part of the country. He had a hunch that Harbhajan Singh would serve him well. The Sikh responded by capturing 28 wickets in two tests against Australia as India stormed to victory in 2001. “Only Mahendra Singh Dhoni hailed from Ganguly's zone, but not from his state of Bengal. Few will argue against this choice, for this Jharkhand batsman-wicketkeeper's eruptive strokeplay has added a new dimension to India's batting and calmness as captain in limited overs cricket." Speaking about India's Captain M S Dhoni, he referred to Chapter 8 of his book, which he wrote just before Christmas. “As for India, their unimpressive display in 1992 (in the World Cup) is not necessarily an indication of their present aptitude. The Indians are today an organised detachment, instilled with calibre and confidence. They are also stewarded by motivating personal example - as testified by Mahendra Dhoni taking the bull by the horns in the final at the Wankhede Stadium four years ago to deliver a coup de grace. “The limited overs format does not demand an exceptional strategic brain, for there is virtually a preconceived formula for captaincy on the field," said Ray. Cricket World Cup: The Indian Challenge is the most comprehensive offering on the subject; as eminently readable as essential reference. It covers all 10 previous World Cups in detail from an Indian perspective, highlighting the 1983 and 2011 competitions, which India won.